The day before we left San Francisco, Brad and I skipped out of the city and headed north into wine country with his sister, Amanda, and our friend Alec. Thanks to recommendations from other friends who scouted the area while road tripping the week before, we drove right on past Napa and Sonoma to the Anderson Valley. This region is known for its Pinot Noir and is truly country – an idyllic valley of farms and vineyards where the four of us spent the afternoon meandering from one tasting to the next. As the sun and the day began to wind down, we all paused for bit to admire some sheep and the scenery that surrounded us – happy and tipsy from the day’s events. I took a photo while gazing out into the valley that reminds me of everything wonderful about that afternoon, and the California sunshine I’ve been craving since we returned to a crispy Fall in Brooklyn. I’m still catching up from my travels, unpacking suitcases (and wine bottles), unloading cameras and processing photos and memories. 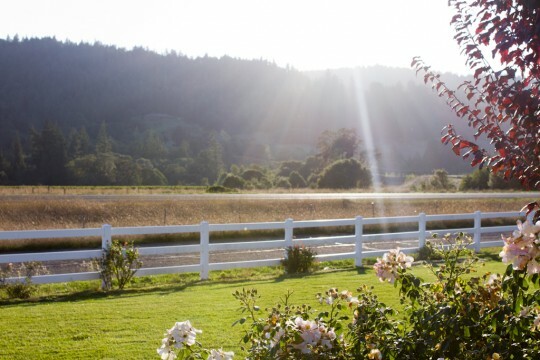 A longer post about tasty adventures in San Francisco is in the works, but if you’re curious about our favorite vineyards in the Anderson Valley, just ask. *Update from 10.26.11: Amanda just informed me that California is not the Sunshine State (as it was in my previous post title), but the Golden State. I stand corrected (and am still dreaming of golden sunshine). Go Anderson Valley! So glad you guys made the trek! We brought back at least one bottle we shall share at Thanksgiving Extravaganza ’12. We loved it! And, we started the day with a wonderfully authentic homestyle Mexican lunch at Libby’s in Philo – Holy Al Pastor! In addition to some nice Pinots, I brought back a few interesting whites. Thinking one of them ought to go really well with Turkey!